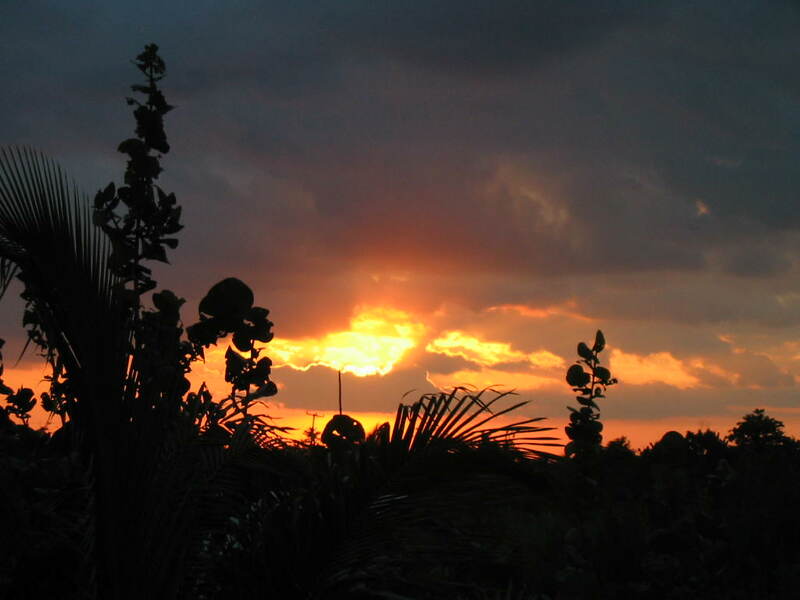 Belize NMS: Generally fair and warm weather will continue. Light easterly airflow prevails. 24-hour forecast: Mostly sunny today and partly cloudy tonight. Showers or thunderstorms will be isolated, with the chance for a few more inland this afternoon. General Outlook: (Thursday & Thursday night) Similar weather conditions. Daily Tropical Weather Outlook: At 12:00 pm the center of extremely dangerous Hurricane Irma was located near 18.5N 64.7W or about 20 miles East-northeast of St Thomas. Today E 5-15 kts Light Chop 2 ft ONLY ISOLATED SHOWERS. Tonight E 5-15 kts Light Chop 2 ft ISOLATED SHOWERS OR THUNDERSTORMS. 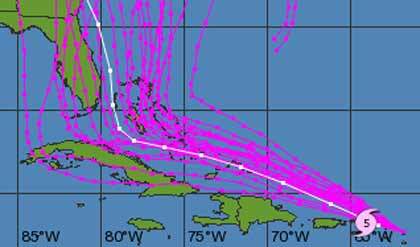 Tomorrow E 5-15 kts Light Chop 2 ft ONLY ISOLATED SHOWERS. 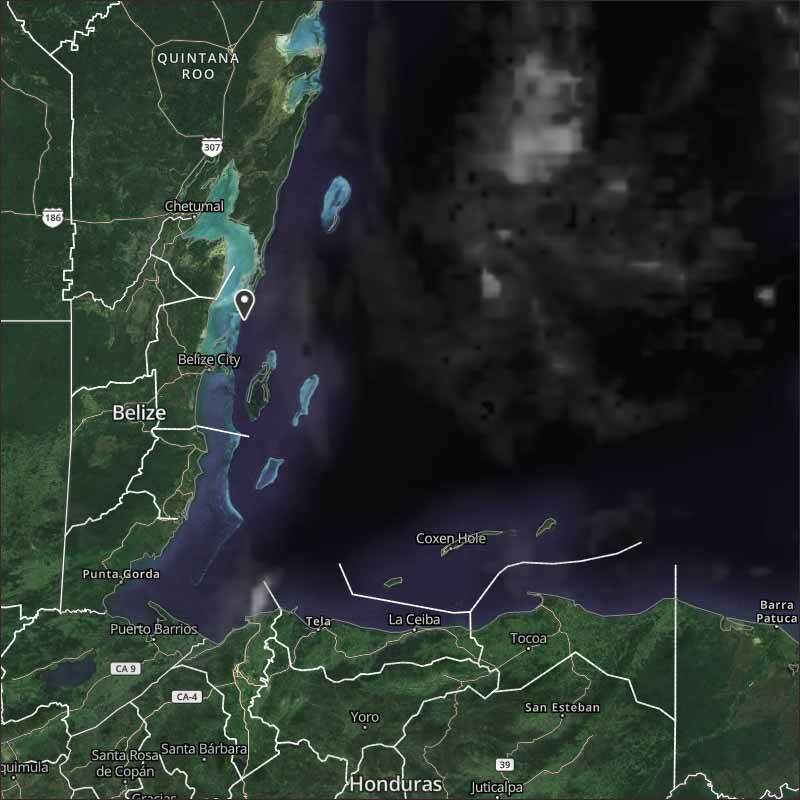 Outlook E 5-15 kts Light Chop 2 ft ISOLATED SHOWERS AND THE CHANCE OF A THUNDERSTORM. 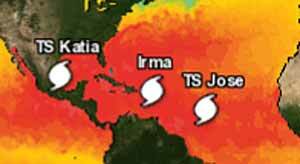 HURRICANE IRMA is now Cat 5. Then TS JOSE is right behind, expected to also become a Hurricane by Thursday. 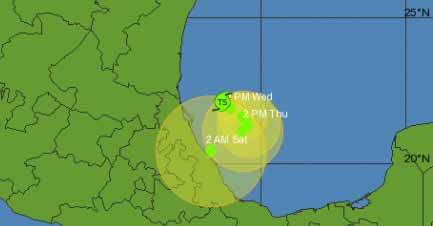 And TS Katia is in the western Gulf of Mexico. 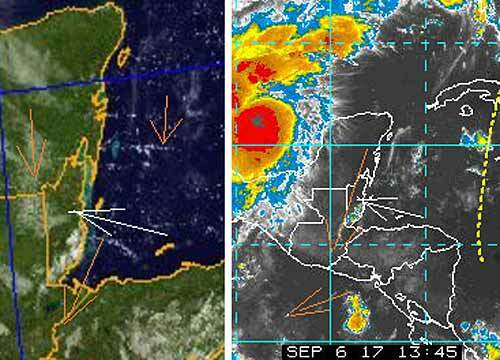 The Caribbean winds continue from the East-by-South, developing lines of white clouds as it crosses over the warming land. There is some high level coming down from the NNE which has caused some rain in parts of southern Belize. Looks like today will be mainly sunny with white clouds, only a small chance of any rain, but more so this evening. This morning storm predictions and pictures. 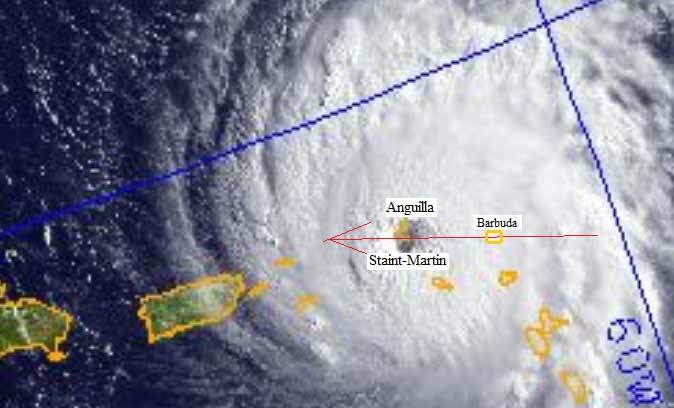 HURRICANE IRMA passed right over Barbuda last night and the southern part of Anguilla and right over Saint-Martin, its mountains, some about 300m ( 1,000 ft ) high, caused some collapsing of the eye, and now the eye is wobbling and not yet reformed. 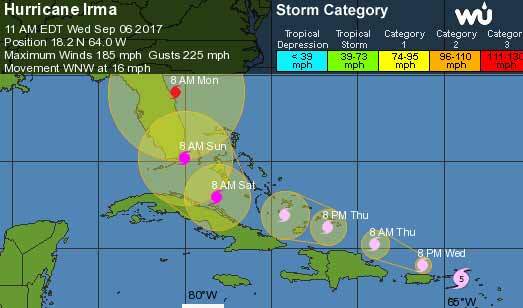 Note : H Irma is not moving due west, it is the picture that is angled, see the long/lat. lines. Be aware that track is only a prediction. bad photos but thanks for posting so we "get it". fellow humans who have been smashed. News from Barbuda is that 95% of buildings damaged. PM says the island is "barely habitable" and they are looking down the barrel of Jose. The BBC tape brought me to tears. Hope there were few fatalities and injuries. I booked a boat there for the middle of Nov. but it isn't looking good from those pictures. I'll wait a week or two before I make any inquires. They have their hands full right now and I'm sure most communications are out. I spent a lot of time there in the 90's with my family; my wife and I honeymooned there on a boat in 85 and now that they are grown and have families we where going to let their spouses have a real Caribbean sailing experience. If not this year then it probably won't happen at all with them wanting more children and other family obligations. Still though, the Island people are resilient and if possible they will back up on the feet and in business.